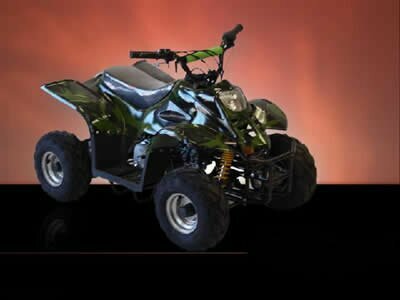 " Now With Front Brakes"
Seat height from ground to top of seat - 23"
Seat to foot peg - 13 1/2"
Foot space width - 10 1/2"
Raceway ATV would like to introduce our 90cc mini ATV. When our customers call one of there most common question pertain to what size ATV do we think would be best for there child's needs! Over and over we hear the same line, "I don't want to buy an ATV that will be to small, but I also do not want to buy an ATV that will be to big." 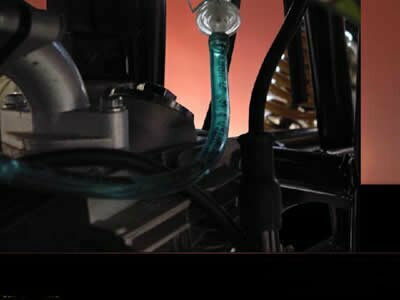 We at Raceway ATV understand our customers needs and concerns. 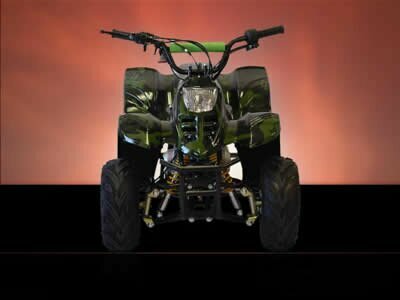 We and our staff understands that a consumer wants to purchase a kids ATV that will be safe along with the right size for growth. 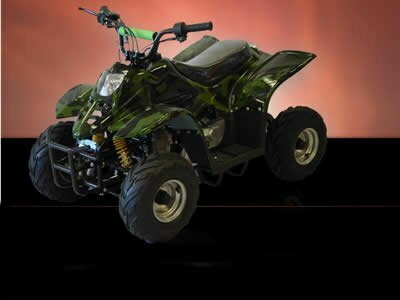 Well, we are happy to say Raceway has found the perfect ATV to fit all your needs. Our new 90cc mini was built to fit that middle size need. 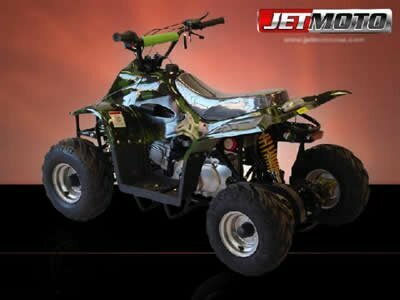 Our 90cc mini was built like an X- large 50cc ATV with the power of a 90cc, you can call it the perfect package! 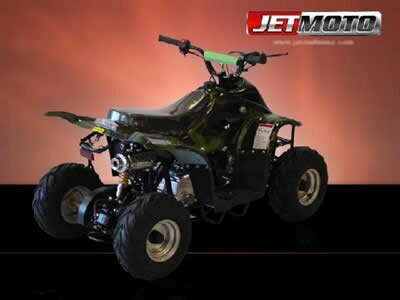 With it's Honda styled engine this 4 stroke ATV is built to last. Straight gas and the rest is a blast! This mini 90 has great power, size and speed for growth. To offer the best of both worlds our mini 90 ATV has a speed limiter screw to control it's speed. The mini can handle it all. 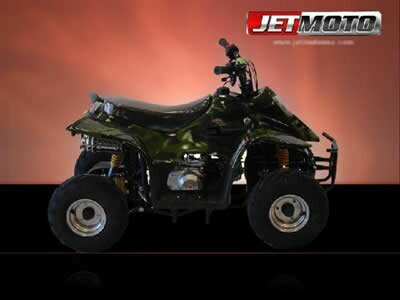 This is an ATV we are confident you will love! Raceway ATV's mini 90 also has the rest of the goodies that most small ATV imports lack. The mini 90 has a perfect designed full sport double A-Arm front suspension. The mini 90 has real front shocks with the perfect amount of travel for a smooth ride. The rear of our 90 mini is built with a mono shock swing arm. 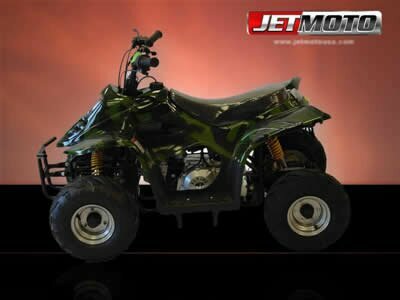 Our mini is also one of the best balanced youth ATV's out there, very stable and holds to the ground extremely well. The mini 90's braking system is a soft hydraulic hand brake system that is safe, responsive and pleaser to operate. It's rear disc brakes and chain is protected by a steel guard, along with a safety guard for the top of the chain. Another great safety feature on the Raceway ATV mini is it's rear tether pull cord kill switch. The Raceway mini 90 also has a stylish rainbow color taillight and perfect sized headlight, and with it's flamed sticker kit the mini 90 looks and performs in a class of it's own.